We are now offering a complimentary subscription to SnoRiders magazine. Simply fill out the information below and we will mail you a copy absolutely free. SnoRiders is published three times a year and its subscription includes that of its sister publication, RidersWest, which is published twice a year. 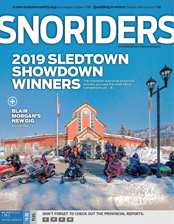 SnoRiders is packed with snowmobiling destinations throughout Western Canada, new products for riders, stories and photos from sledders and much more. Don't worry, we promise to keep your personal information private, and you can unsubscribe at any time by returning to this page. Our SnoRiders Online Magazine is an exact copy of the print version of SnoRiders — which is published three times a year — giving you the same great articles in an easy-to-read digital format. In addition, it provides direct links to any online resources you come across in the magazine. Please fill out the form above, and then select your desired action below. SnoRiders is only available to residents of Canada and the United States. The individual demographic information gathered on this survey is confidential. It is only used to create an overall reader survey profile and is not sold or provided to any third party.